The other day I roasted a chicken and we didn’t even eat it for dinner! It was one of those days. We are remodeling this old cottage and the weekends are completed devoted to just that, sun up to sun down. I had purchased a whole chicken and didn’t want to freeze it so I roasted it knowing we were not going to be able to have a sit down dinner. I am glad I did because using the chicken the next day for chilaquiles was a delight. Served with jicama slaw. Combine the oil and garlic in a large heavy bottom pot. Cook over medium heat, stirring occasionally until the garlic is fragrant, 1 to 2 minutes. Add the tomatoes with their purée, chipotles and adobo sauce and 1 cup of water. Break up the tomatoes, season with salt and bring to a boil. Reduce the heat and simmer until lightly thickened, about 10 minutes. Add the chicken and continue to simmer for 10 minutes. Turn off the heat and add 1/2 cup chopped cilantro. 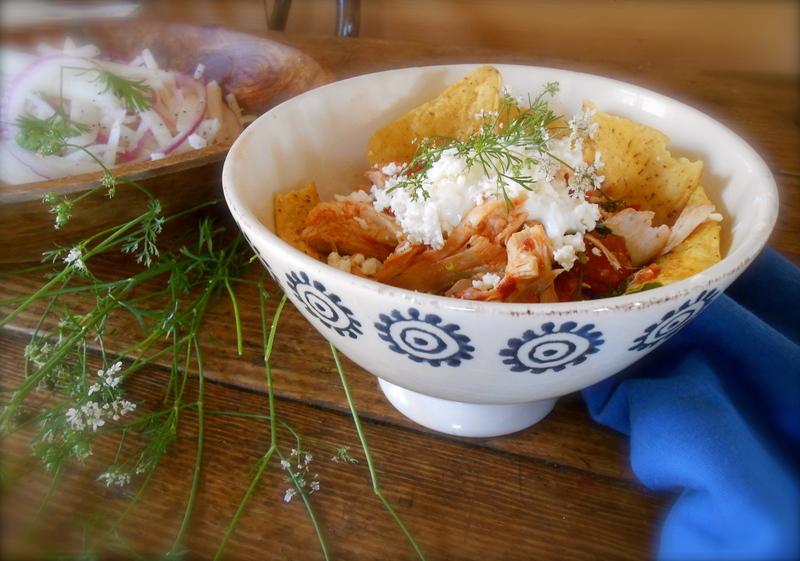 Place a handful of chips in a serving bowl and top with chicken chilaquiles. Make sure to spoon a little extra sauce on each serving. Garnish with cilantro sprigs, greek yogurt and crumbled cotija cheese. Jicama is such a curious root. “The root’s exterior is yellow and papery, while its inside is creamy white with a crisp texture that resembles raw potato or pear. The flavor is sweet and starchy, reminiscent of some apples or raw green beans, and it is usually eaten raw, sometimes with salt, lemon, or lime juice and chili powder. It is also cooked in soups and stir-fried dishes.” (wikipedia) I simply added lime, a little thinly sliced red onion, cilantro, salt and pepper. This was so cool and refreshing alongside the warm, spicy chilaquiles. This was a perfect matched dinner, texturally speaking. The soft spicy chilaquiles, creamy yogurt, crunchy tortilla chips and the crispy cool jicama all together sang in harmony with each bite. I did not want the red onion to be dominant in this slaw. Use what your palate enjoys and play around with the lime juice as well. In a medium bowl place all the ingredients and toss well. Serve right away, or allow to marinate in the refrigerator for up to 6 hours. Having a cooked chicken in the refrigerator id so smart. Quick fix dinners with that on hand. It is so true. Not a bad idea to do one every weekend. It sure makes dinner easy to have it there and ready. The chilaquiles only took 30 minutes from start to finish! What a great idea for the chicken. And props for finding time to blog with all the work you are doing on the cottage! Thank you! I got up this morning and can barely move after yesterday! Some of this work is so physical. Blogging is so fun for me I’ll always make time. :) Thank you for your kind comment. This is the first time Ive heard of jicama! It kinda looks like sliced red onions in the picture of them you have! Now that is new food…to me. Really delicious ideas and lovely pictures. Good luck with all the hard work. Yet another ingredient I haven’t heard of. Which kind of reminds me of when I was in Houston 5 years ago. We went to a Tex-Mex supermarket and I could hardly believe the veg section – so many beautiful looking veg that I’d never seen before. Unfortunately, even though one of the people I was with is from there, they neither knew the names or what they would be used for. Darn! Could’ve stayed several hours. That is really funny. I have the same experience when I visit California. Some very interesting vegetables, roots, plants and cactus’ to eat! Very foreign to me. However, it is an entertaining walk through. Jicama is so refreshing! I’ve never had the pleasure of cooking with it, but I imagine it’s perfect for summery slaws. Love this post! We had chilaquiles for brunch out, visiting our daughter in Chicago and I’ve had them on the back of my mind every since. And I love, love jicama–sweet and fresh. thanks for the recipes! Yum, this looks amazing. Love how you work around the food “challenges” (roasted a chicken, but no time to eat it–will make chilaquiles :-) ) Agree that jicama is a curious root. You added great flavor with the lime juice, etc. And you have made me very hungry! yum! I’ve only used jicama once, and I got carried away and overloaded an avocado salad with it :P I’m sure I’d like it when it’s not overwhelming all the other ingredients. Good luck on the remodel! This sounds really tasty! I know what you mean about finding time to sit down and it, let alone cook! Things can get hectic. I hope your remodeling goes well. Good point. I wish I could think ahead more often. It would make my midweek a lot easier. OK another “foreign” ingredient, please explain jicama…………. It used to be very foreign to me too! :) But you can find it in every market you walk into over here. Jicama is a pale brown turnip with crisp sweet flesh, originating in Mexico it is such a curious root. The root’s exterior is pale brown and papery, while its inside is creamy white with a crisp texture that resembles raw potato or pear. The flavor is sweet and starchy, reminiscent of some apples or raw green beans, and usually is eaten raw, sometimes with salt, lemon, or lime juice and chili powder. It is also cooked in soups and stir-fried dishes. Could jicama be substituted with nashi pear? By your description it sounds like there is a similarity. hmm. good question. I think so…if pear is really crispy, why not? What I really like about jicama is it’s crunchiness and it stays like that too even if you marinade it for days. I bet the pear would be good as a slaw with lime and red onion. Yes, do explain re jicama! I’m not sure what it is either. I was also intrigued by cotija, your suggested sub for feta cheese. Don’t think I’ve ever had/seen cotija. Shall be on the lookout! Remodeling is so much work and but it is so much fun too. Enjoy the process! Beautiful. I love chilaquiles and jicama slaw. This is like my ideal breakfast! Thanks for sharing the recipe! Looks delicious! 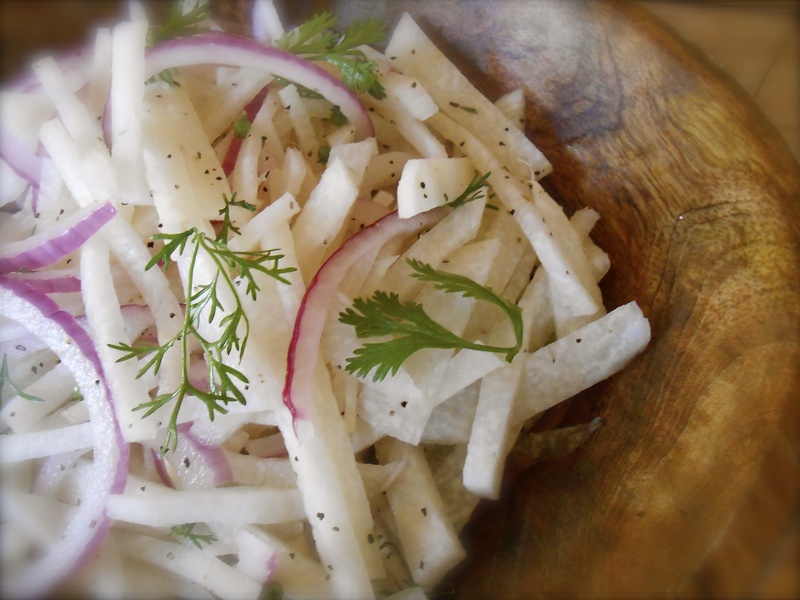 I love jicama and what a great idea to a slaw with it! Your chilaquiles look so good. And isn’t jicama wonderfully refreshing? Yes it is! I really enjoyed the jicama with this spicy chicken dish. Cooled it off and gave a great crunch element to the dinner. I’ve never seen jicama either. Will look for a picture on google…. I am so glad you find the time to cook and blog while remodeling your cottage. I don’t know how you do it but I’m impressed, inspired, and hungry! Good luck with everything! I’ve never seen jicama for sale here in Australia. It often pops up in US recipes and I’m very intrigued! I’m wondering whether one of the Japanese root veggies would be a good replacement, like daikon or taro? Is jicama close to a radish in texture? I’d love to try your slaw – lately I’ve been making slaw once a week and I’m tiring of my own recipes (as are the family)! Good question! The texture is close to a radish, however, there is not a trace of radish flavor in jicama. I read somewhere a white turnip can be used in place of jicama. The texture of jicama is like a crisp apple, but not as sweet as an apple. Do you have turnips in Australia? I am not familiar enough with daikon or taro root to say, but I would be willing to try in a slaw. We do have white turnips here. From your description, I think they’ll be a good replacement. Daikon is like a cross between peppery radish and white turnip, so that could be good too. Will let you know how it turns out! Oooh yum! I love jicama! Looks delicious! Jicama slaw sounds delish. I’m feeling a bunch of cilantro in this and let’s put in on fish tacos. Yes? You are currently reading chicken chilaquiles and jicama slaw at COTTAGE GROVE HOUSE.